- With WAVECOME double frequency GSM module. - Can program open/closed alarm of digital inputs. - Digital inputs are adopted optical-coupled isolators, which can prevent external high voltage from destroying internal components. - Send SMS automatically to report the state of digital input when it returns normal status. - Send SMS to 3 preset mobile phone numbers while alarming. - Auto-dial 3 preset phone numbers while alarming and monitor the sound at site. - Modify zone name and enquire status of alarm host by SMS demand. - With standby rechargeable battery and external power failure alarm. 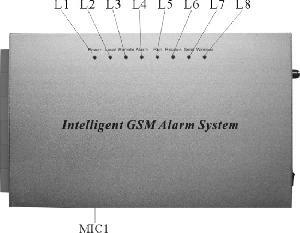 - Connect with alarm centre through GSM network.